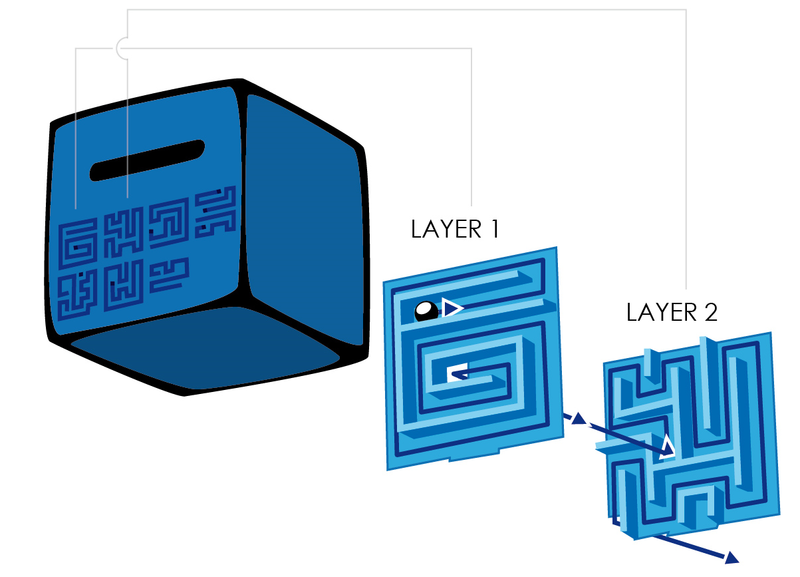 A unique handheld ball maze. I N S I D E 3 is simple. A 3D maze played in the dark! Just free the ball on the front and watch it fall in the dark. Then try to stear it to the other side. All you have to do is follow the map engraved on the surface. INSIDE³ is quite simple. Just a 3D maze played in the dark! Just free the ball and watch it fall in the dark. Then try to steer it to the other side. All you have to do is follow the map engraved on the surface. Please see our demonstration video for a animated explanation. 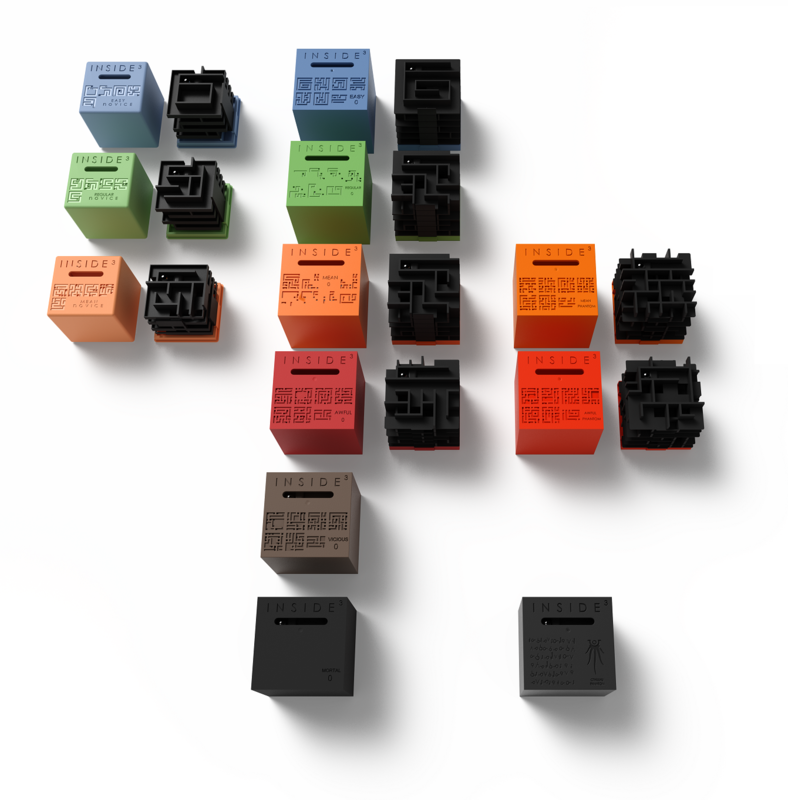 The series 0 are the original cube , with the wide range of difficulty level. You still don’t understand? Ok we’ll help you. Each hieroglyph is a layer of the maze. First layer is on the up and the left of the map and last one is of course on the right and down. But be careful, the ball at the begining is not on the up and on the left of the first hieroglyph! A small black square matches with a hole in the layer of maze. It allows the ball to reach a lower level. 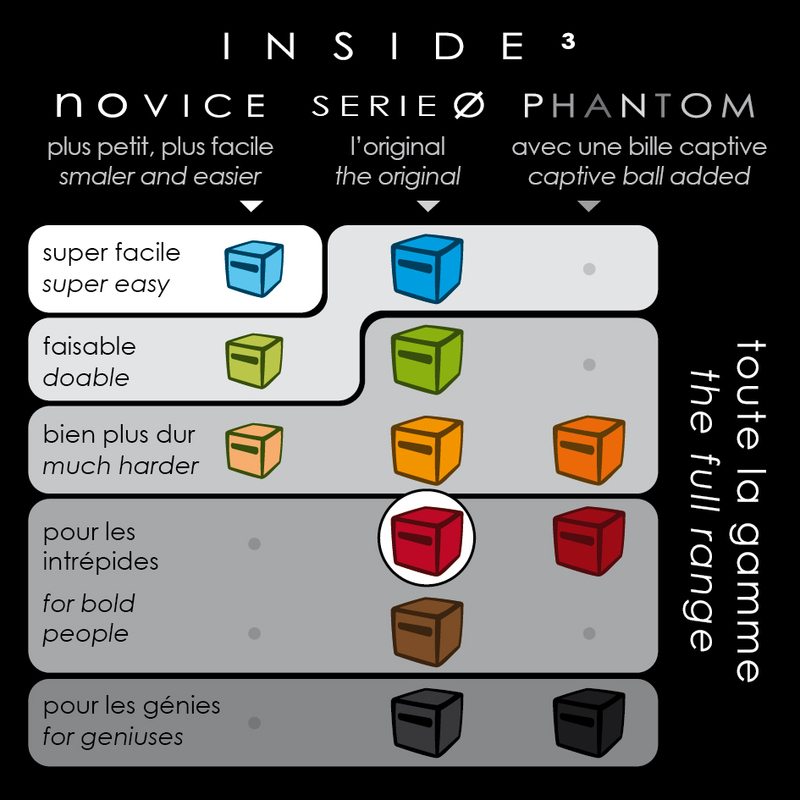 Just below we show you the small difficulty between levels 4 and 5 of easy0. When arriving at 5th layer, there is no hole at the end of the corridor! You have to go back to the 4th level (in fact the hole exists but above the ball as you can see on layers’s 4 map). So you have to climb back of 1 level, then follow the map. This time there is a hole at the end that will bring you right down to 6th level. Ok you’re just fed up with the cube and you are lost. No problem you can open it. (**VIOUS & MORTAL cannot open) You just need a nail. It’s better to take that decision before you bite your nails of course. Otherwise you can as well use a toenail. 3) There is a groove inside one of cube’s side and it is matching with a locating pin on each layer. You have to make them match! 4) The bottom cover shall be 180 degree opposite as the top. That's it!